The Peak Stereo Viewer is a simple device designed for viewing a set of three-dimensional aerial photos in three dimensions. This viewer is supported by two metal legs which are unfolded to a standing position. The viewer is then placed over the aerial photos, which are spread out on a flat surface, and the photos are viewed through the two lenses simultaneously with both eyes. 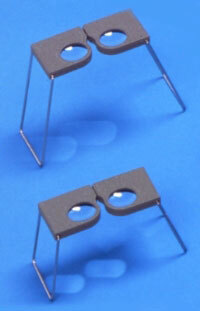 The coated glass lenses are 32mm in diameter and magnifying power is two times. The lenses can be easily adjusted for eye-to-eye width. In general, of the overlapping set of photos, the one with the lower number is placed on the left side and the photo with the higher number on the right side. If this is not performed correctly, a mountain, for example, will look like a valley.